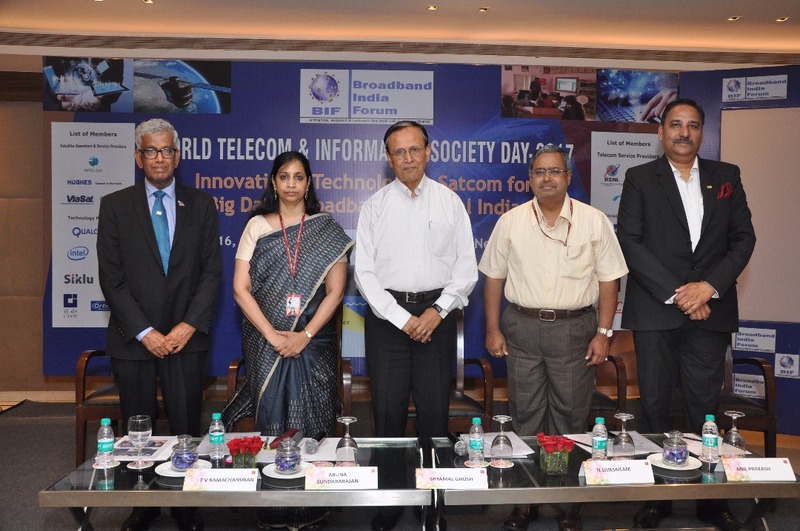 On the eve of the 2017 World Telecom and Information Society Day, Broadband India Forum (BIF) lauded the latest brilliant achievement of ISRO in launching the Regional Communication Satellite for South Asia –GSAT 9 to fulfill the vision of our Hon’ble Prime Minister Shri Narendra Modiji and pointed out that this historic step highlights the great possibilities of modernized Satcom for connecting and delivering broadband in a large country like India which has significant stretches lying in remote and inaccessible areas. In a function by BIF to celebrate the World Telecom & Information Society Day 2017, the tremendous possibilities of modernized Satcom for India were highlighted by all speakers. Smt. Aruna Sundararajan Secretary, MeitY and DoT, was the Chief Guest and Shri N. Sivasailam, Additional Secretary, DOT was Special Guest of Honor at the event. In his Welcome Address, Emeritus Chairman of BIF, Shri Shyamal Ghosh, IAS (Retd),categorically stated that “Use of Satellite for providing internet services is perhaps the only way to cover the entire country. Its importance of meeting the objectives of Digital India and for providing ‘Broadband to All’ by 2020 cannot be overstated”. Mr Ghosh pointed out that while India through our own Department of Space and ISRO has made rapid strides in the areas of manufacture and launch of indigenous satellites and launch vehicles for satellites, we have a long way to go to meet the communication requirements of our country in an affordable, always available and accessible-to-all manner. While the global satellite industry is pegged at around 600 communication satellites, India has only a handful of them – all of which belong to ISRO. As per ITU, India ranks at a lowly 131 in Fixed Broadband and 155 in Mobile Broadband out of 187 countries. Moreover there is a large Urban Rural Digital Divide. Since Terrestrial Broadband being expensive and difficult to roll out, the only option to provide broadband in rural/semi-urban areas is via Satellite. Hence the inevitability of Satcom broadband cannot be disputed. Mr TV Ramachandran, President of BIF, stated that regrettably due to certain factors, there is a mistaken perception that Satcom is unaffordable and therefore unavailable for deployment for a highly price sensitive market such as India,especially Rural India. He asserted that this is totally incorrect and fallacious, just as in the early 1990s, it was thought by even educated segments of society that mobile phones are unaffordable technology toys-playthings of the rich, and not needed by the common man. Globally, Satcom is competitive to terrestrial technologies particularly for rural and remote areas. However, it lags behind in India due to inadequate capacity /availability, lack of use of new innovations& technologies and other legacy factors. Experts point out that by offering HTS with Ka-band, it is expected that the Cost/Gb could reduce by a factor of 7 along with multi- fold increase in capacity. This along with relaxation of outdated technical specifications for receiver terminals, freeing up the market and allow open competition between international & domestic satellite operators, increase of the term period of the contract between the Satellite Operators and Service Providers from 3 years to at least 10-15 years to enjoy economies of scale are factors which would enable costs to become competitive. BIF has conservatively projected India's required broadband over satellite demand at between 100 and 200 Gbps over the coming five to 10 years, a big fraction of the Asian satellite broadband demand as projected by NSR. Liberalized implementation and facilitation of the latest innovations in this sector to help cater to this projected demand, shall enable the sector to achieve FDI of $3-5 billion that can be brought in to launch satellites, develop and manufacture satellite gateways (ground terminals) and also for the manufacture of end-user terminals (micro-VSATs, satellite handhelds, etc). Huge FDI inflows along with creation of tens of thousands of jobs are also possible from clearing long-pending private sector applications for manufacture and launch of satellites. Investment is also likely to come in for training and skilling local manpower to provide the professional services required in this sector. This will bring in much-needed FDI and also lead to a spurt in local manufacturing of satcom components (including development and launch of our own satellites), thereby leading to the creation of a large pool of skilled manpower and tens of thousands of new jobs. Chairman Emeritus of BIF. Mr T.V. Ramachandran, Chairman, European Business Group India – Telecom and Founder & CEO TVR@Advisory is the President of the Association. Other distinguished office bearers who actively participate in BIF include Mr Vimal Wakhlu – CMD, TCIL, Bharti Airtel, Mr TR Dua – DG, TAIPA, who are Vice Presidents. Mr.S.N.Gupta, Country Head, Blue Town Wifi is the Treasurer. Besides, Mr P.K. Garg, former Wireless Adviser, is associated as Adviser to some of the Expert Committees of BIF.